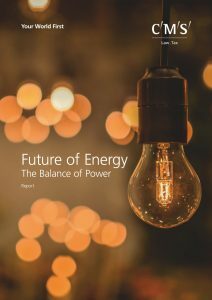 In 2017, Tom worked with global law firm CMS to produce the report, ‘Future of Energy: the Balance of Power’. Using his proprietary Intersections methodology, Tom analysed the future of the energy market. The result was an easily-accessible guide over 27 graphic-rich pages. The report was launched at the CMS head office in London with Tom as guest speaker and part of a lively panel session in front of 150 industry specialists. experience in the energy sector.